Every once in a while I write something that seems worth sharing. Four years ago it was an essay in Rolling Stone about the new math of global warming that helped trigger the divestment movement. 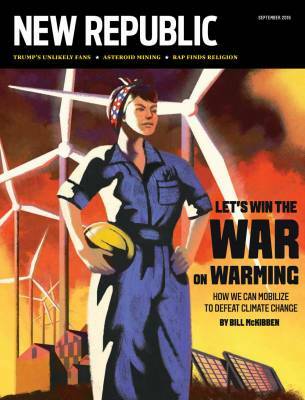 Today it's a piece in The New Republic about the war—the literal war—that global warming has become. We're used to metaphors: the war on drugs, the war on poverty. But in this case carbon and methane—without malice but also without mercy—are waging a war on the civilization that emitted them. This year we've lost huge swaths of the world's coral; vast sheets of ice disappear daily. Our adversary is taking territory and taking lives. So what would it mean to fight back? Most of the piece is devoted to that possibility: thanks to the engineers who have driven down the cost of renewables, we're at the first moment where that's a possibility. If we wanted to, we could—as a world—replicate the industrial miracle that won World War II. Instead of bombers we'd build turbine blades; in place of planes, solar panels. The reporting in the piece shows that putting up enough renewables to get us back on the path to 350 parts per million is possible—barely. Thanks to researchers like Stanford's Mark Jacobson, there's a plan for every state and most nations; the question is, can we build for the future with as much commitment as we once built for war? The answer to that question is in our hands. I hope you'll read and share this piece while this odd election season drags on; please share it with your friends and family and Facebook crew so that we can build the peaceful army we badly need. By winter, our movement will be pushing harder than ever. Not just for change but for change on the scale we need. P.S. If you want a sense of what this war looks like today, here are some pictures from Louisiana where completely unprecedented flooding has now killed 7 and forced 20,000 rescues from homes, cars, and hospitals. As in any war, we need to take care of the people being impacted: relief efforts can be directed here. And Louisiana is not the only place. We're also thinking of our colleagues in sprawling Manila today, where flooding has also claimed lives and left thousands in evacuation centers. On a more hopeful note, brave fighters in North Dakota are taking a remarkable stand right now against a new pipeline planned for the edge of the Standing Rock Sioux reservation. Donate to their legal fund here.